The name “Salish Sea” acknowledges the cultural and ecological connections between the Puget Sound, Strait of Georgia, and Strait of Juan de Fuca. The sea spans the US/Canada border and includes the homelands and homewaters of dozens of Coast Salish nations. Richard M. Hutchings and Howard MacDonald Stewart both locate their recent books in this transboundary place and each crosses disciplinary boundaries to address history and heritage in the ecoregion. Putting these very different texts into conversation opens questions about methodologies, voice, and pedagogies in regional histories and heritage studies. Stewart’s Views of the Salish Sea blends genres of narrative history and coffee table book, with big glossy pages and dozens of photographs. Adapted from his doctoral dissertation in geography, the book describes one hundred and fifty years of human history (almost: 1849-1980s) through five different framings of the Georgia Strait: 1) as barrier and highway for transportation of goods and people; 2) as a colonial and colonized space, deemed empty by early British colonizers and stolen from Coast Salish nations; 3) as a resource treasure trove for mining, forestry, fishing, and shellfish industries; 4) as a waste dump for industries and municipalities; and 5) as recreational refuge for tourists and residents. The final chapter jumps to the 2010s to describe ongoing and emergent concerns in the region, including overfishing, pollution, and climate change, and shifts including changes in governance structures and Indigenous sovereignty in an era of modern treaty negotiations. Written in accessible prose, the chapters provide broad overviews of prominent figures and processes, with occasional anecdotes and stories. Stewart’s observations are interspersed throughout, often in a deliberate attempt at evenhandedness that resembles a mix of investigative journalism and editorial, particularly in the last chapter. The promise of an “interwoven” narrative is not fully achieved, though the final chapter provides some common threads, including a fear of loss of place, resources, and power among subsequent waves and factions of residents in the region. Hutchings’s Maritime Heritage in Crisis presents a critique of archaeology’s response – and contribution – to coastal change effects on Indigenous heritage sites. He details how anthropogenic (specifically industrial capitalist) climate change is impacting coastal cultural and natural heritage sites in Indigenous homelands, with specific case studies in the Salish Sea region. The book begins with the assertion that “Indigenous maritime heritage is under assault worldwide, and archaeology is part of the problem, not the solution,” and Hutchings builds this argument over six concise chapters (1). Chapter 1 sets out his terms of engagement, including geographic scope, definitions, and intellectual trajectory from geoarchaeology to critical theory (“This new tack led me directly to the harbor that is modern capitalism. I have remained moored there ever since. It is a dark and stormy place” (5)). Chapter 2 describes mechanisms of coastal change through sea level rise and population growth and sprawl, highlighting increasing pressures on Indigenous maritime cultural landscapes in British Columbia and Washington in the Salish Sea. Chapters 3 and 5 examine how the Cultural Resource Management (CRM) regime in the region supports industrial capitalism and real estate by clearing Indigenous maritime heritage landscapes for development (97% of archaeology in the British Columbia is CRM or “compliance work” vs. 3% academic archaeology). Chapter 4 presents excerpts of the shíshálh Strategic Land Use Plan, with Hutchings arguing that the nation’s sovereignty and efforts to protect their coastal heritage are constrained by accelerated development sponsored by British Columbia’s “center of power” (Victoria and Vancouver), aided and abetted by the province’s CRM regime, which he labels “neoliberal statecraft.” In his conclusion, Hutchings prescribes radical engagement through truth-telling about CRM complicity and much broader systemic downscaling, specifically “dismantling national and provincial governments and refocusing on local control over local issues in local landscapes” – presumably through shíshálh and other First Nations governing the Salish Sea’s coasts and heritage sites. The two books approach issues of heritage and history quite differently. Stewart crafts conventional and chronological narratives refracted through his frames of analysis with very light theoretical treatment – perhaps too light at times. Hutchings, on the other hand, relies heavily on critical theory to illuminate the values underpinning archaeological practice and to critique the role that development plays in destroying Indigenous maritime heritage landscapes. His case studies sometimes feel more like fodder for his theoretical arc than nuanced narratives of messy complexities on the ground (or in the water). Both approaches raise methodological questions about doing regional history and heritage studies. What guided Stewart’s archival practice and methodological decisions about stories to tell and how to tell them? How did he endeavor to consider mainstream histories along with marginalized voices? Why did he choose to begin at the start of settler histories, reifying a short-term timeframe already featured in so many histories of this much longer-lived region? For Hutchings, did he receive consent from the shíshálh Nation before writing a case study about their homelands, coastlines, and land use plan? (There is no indication that he did, nor any description of engaging with the nation in his year and a half living on their territories.) What are the ethical implications of writing a critical treatise about Coast Salish maritime cultural landscapes without centering and citing Coast Salish people as analysts themselves (and not primarily data for discourse analysis)? What is the authors’ responsibility for reflecting on their positionality in relation to the systems of power they analyze in the Salish Sea region? For readers interested in cross-border issues in the Salish Sea, it is worth noting that both books are heavily skewed toward the British Columbia side of the region, and miss some opportunities to share comparative and complex portraits of transboundary issues. Stewart offers North Salish Sea as an occasional synonym for the Strait of Georgia, and gives only cursory attention to American influences or cross-border concerns. Hutchings comes closer in his chapters on coastal change and cultural resource management, with data and cases from both British Columbia and Washington State, albeit unevenly presented and unintegrated. As such, the texts do not significantly enhance the small but growing literature offering sophisticated cross-border histories or analyses, such as Katrina Jagodinsky’s Legal Codes and Talking Treesor Lissa Wadewitz’s The Nature of Borders. These issues will need to be taken into consideration when deciding how to cite or assign these texts, perhaps offering pedagogical opportunities for students in anthropology, archaeology, history, geography, and Indigenous Studies. I anticipate the books will appeal to somewhat divergent audiences, with Stewart’s Views of the Salish Sea well-suited for some introductory courses on regional history and already popular with the general public, as evidenced by its six weeks on the BC Bestsellers List in Fall 2017. Maritime Heritage in Crisis will find an audience within and beyond the region among professional, academic, and aspiring archaeologists, despite Hutchings’s characterization of his critiques as “blasphemous” to the discipline (1). Read together, the books fill in one another’s gaps in some ways, providing additional context here, balancing out theory and description there, and offering quite distinctive pathways to a similar call to action: “We have no excuse for squandering this place… in our rush to satisfy short-term needs or fulfill the shifting priorities of industries or governments that are demonstrably not acting in the best interests of our local or global communities” (Stewart, 274). 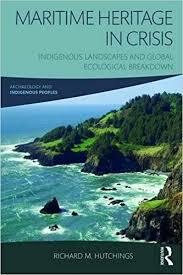 Maritime Heritage in Crisis: Indigenous Landscapes and Global Ecological Breakdown. New York, NY: Routledge, 2017.144 pp. $44.95 paper. 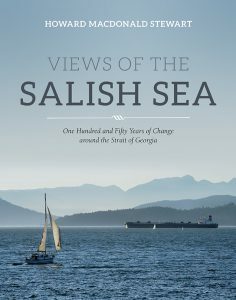 Views of the Salish Sea: One Hundred and Fifty Years of Change around the Strait of Georgia. Madeira Park: Harbour Publishing, 2017. 288 pp. $39.95 cloth.